Aarohi, an experience that elevates my soul journey. How else could I explain tears rolling down my cheeks while meditating at Aarohi? I have never had such an emotional experience while meditating. The tears were representative of freedom, the tears represented the happiness at seeing a child being treated with respect. As an occasional blogger, I only write when words associated with an experience feel caged within the confines of my heart, the words fluidly come out to spread my life learnings with the wider community. At Aarohi, I met children who had never been to any school, I met children who have taken a gap year from the conventional schooling system, I met homeschoolers, I met children pursuing the curriculum of a traditional school. When I facilitate parent cafe, parents often wonder of how to raise children who are emotionally intelligent? Aarohi offers a real solution to this predicament. A child who learns to connect with one’s own heart has found his/ her passion, his/ her purpose and has learnt how to live freely. At Jaatre- Celebration of learning, various ideas from exploring numbers, mathematical concepts to sharing about world war to learning a new craft or learning about entrepreneurship journeys are explored, Aarohi for sure knows how to celebrate learning and offer an unadulterated learning opportunity and space to it’s community and guests. 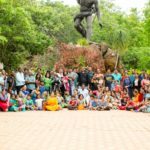 Aarohi is for everyone, it is for homeschoolers, unschoolers, free range learners, conventional school goers, alternative school goers, teachers, families, parents, artists, researchers, educationists, travellers, seekers, everyone. It is a space to learn and offer your gifts. Let me invite you to walk with me through my experience of living at Aarohi for three days with my partner, Shaunak and my 3 year old daughter, Raedita. Aarohi is a place where children get to be children, a land where children are offered a safe and non-judgmental space. 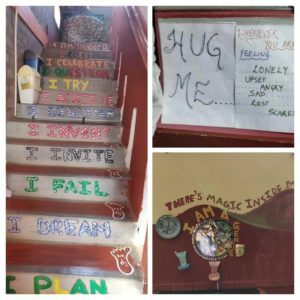 As I first walk through the doors of Aarohi, what strikes me is that the environment and the energies at Aarohi are welcoming, supportive, loving, thought-provoking, self-explanatory. 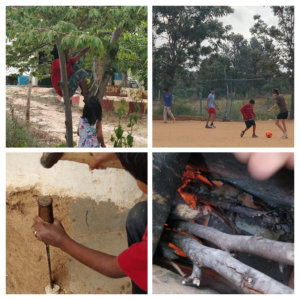 The learnings at Aarohi can come from the environment, from nature, from the facilitators, from children, from guests, from various online facilitators who gift their skills through video calls. A day at Aarohi starts with sunshine at six in the morning and ends with lights off at ten in the night. I am attempting to delve into most of the aspects of a day at Aarohi. In the morning, after meditation, children set out their goals and plans for the day, which are in line with their term plans and vision. During the day, I would observe children engage in their chosen path, if a set of children make a film, somewhere else a child might be painting, or a child might be studying following a curriculum, or a child might be climbing a tree or a child might be engaged in the carpentry or a child might be practicing singing or learning about forensic psychology on YouTube or perhaps a group of children might be making a mud refrigerator or a group of children might be learning a new recipe. The self learning is only supported by facilitators by a process of inquiry through open ended questions at the time of planning every day. With freedom does comes great responsibility. While children choose their path, facilitators support children to walk their chosen path. Aarohi manages to strike that perfect equilibrium in support and freedom. An equilibrium- I feel most parents are trying to achieve in their parenting journey. When I observe my 3 year old daughter, I learn from her that it is her natural instinct to do productive work and to take responsibility for her actions. She surely feels empowered by taking responsibility by participating in household chores. Aarohi truly empowers children offering an autonomous space for co-creating the space with suggestions, ideas, designing of structure, volunteering to take up a job and also some non- negotiable agreements for taking care of the campus. Every child has a job to perform, the job can be that of a coach or a receptionist or that of an accountant. If an 8 year old child is responsible for the pets, a 13 year old is responsible for providing with hot water, a 12 year old is part of the kitchen management team and the list continues. 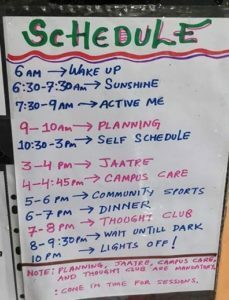 At the time of the campus care- children, facilitators and guests get absorbed in assuming their chores and well, most of the times the chores are performed with a lot of zest. 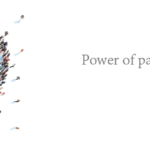 A process that ensures that people of all age groups have a chore to perform, every human being has a responsibility ensures that the world is being gifted with responsible citizens who are capable to make conscious and independent decisions. campus care support the physical growth of every child. Community building the basic human and social skills of learning how to create, care and live in a community. Spiritual learning- The most effective way to derive wisdom is to be in solitude. At Aarohi, children are supported to meditate, to introspect, to spend time with oneself, to pen down their innermost thoughts and feelings. Silence as a language is spoken at Aarohi. Based on my own life learning, I am certain that these holistic processes will remain edged in the conscious and/ or the sub-conscious mind of Aarohi children as they weave their own adult These processes will always act as a point of reference wherever they go. What subjects do children learn at Aarohi? 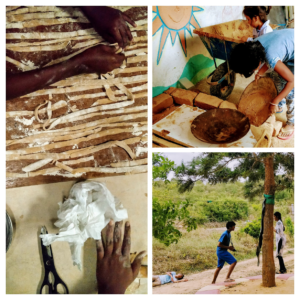 “When we step back and observe children in deep, meaningful play experiences, we find children naturally working on everything from engineering, to art, to math, to physical literacy, to complex problem solving skills and advanced social dynamics”. The key is to give them plenty of opportunity to do so and Aarohi Life Education and their facilitators seems to be doing just that. As much as I have a dislike for compartmentalization of subjects, I will still elicit the various “subjects”, so as to suit the ideological beliefs of all readers. At Aarohi, children are living and experiencing multiple subjects in a harmonious way without perhaps a realization that they are learning. They are simply living and the the campus and it’s inhabitants are teaching them all of the below “subjects” without any intention of teaching. There is no adult driven agenda, the adult only facilitates every child’s self learning journey. By having a space devoid of any adult agendas, children end up learning multiple perspectives rather than learn about one particular subject from one perspective. However, none of the above learnings would have been possible if not for a safe space for children to be their authentic self, if not for a space that supports them to identify their own feelings, to connect with their own inner being, to be free to be themselves. Adults and children learn to identify and manage their emotions. Aarohi is a service to mankind, it is an extra-ordinary gift to the society where a child can identify the subtle difference between various emotions. What is far greater in spirit is that the children have a right to decide, if they wish to live at Aarohi- or not, if they wish to live for a day, a week, a month, a year or years. There’s no threat or bribe or cajoling. Children have complete autonomy on their decision. So, any child whether a school going child or a homeschooler or an unschooler can choose to enjoy the sweet learning of Aarohi for a day or a week or a month or a year. The learning is so natural that children as they become adults would have internalized the learnings and the way of life of Aarohi’s community, such is the power of Aarohi. Aarohi is an answer to the society that is obsessed with segregation of education by disconnecting a human being from one’s own self. Aditi, Ratnesh, Leela and Aparna look at themselves as facilitators and and not as “teachers” who need to supervise or control children. To me as an observer, if Aditi was like a motherly facilitator who would in her own way assure that every person present on campus is well fed and well taken care of, then, Ratnesh was like fatherly figure who is as much loved by the community of children who welcome his laughter, his eccentricities, sometimes stringnet instructions and childlike, twinkling eyes. I look at all the facilitators as facilitipants who not only support a child’s journey, but become part of their journey. If the facilitipants would learn and participate in acting, in playing, in singing, in designing, every child would participate in framework of the structure, the creation of the whole space and teaching and supporting each other. In that respect every member of Aarohi’s community is a teacher and a learner and a co-learner. Each and every person’s contribution is what makes Aarohi truly a space co-created by every person who stays on the campus. By giving up on any adult lead agendas, by giving up of any authority and by assuming a role of being a gentle leader in the lives of every child, Aditi and Ratnesh have been able to create an exquisite space where every decision is co-owned by the community, where every individual is respected, where a safe space is created and above all where a child is able to connect with his/her own authentic self. How very fortunate are children who grow up in a space which is free from any objective to derive monetary benefits. A space which puts a child and a child’s needs at the heart of the campus. Aarohi has created a space where autonomy to be one’s own self ensures that no child is bullied or no child gets to be in the ego trap of being a senior or where no child paints or creates or studies to win a competition or to be better than a friend, each child engages in a learning activity or a chore to just be true to their own self. A campus which is designed and continues to evolve to support children in their life journey. Aarohi strives to prepare children to be ready for life. When I look at children who live with mixed genders and mixed age groups, children who are always supported to be true to their heart, mind and body, where empathy is a way of life, where every child has freedom, where every child has a right to choose, I can only imagine a beautiful world that these children will create in their adult life. Aarohi is derived by the energy to derive no particular position, to fulfil no ambition, to derive no monetary benefits, or any ideal. Aarohi gets it’s energy from creating a space where a child gets to be a child, from all the accompanying cheers, the twinkles, the tinkering, the disappointment, the frustrations, the problems, the failures, the conflicts, the everything. This is in my eyes is the beauty of Aarohi. Aarohi is a precious space and it draws it’s energy by trusting children, by having trust that every child is learning not only from the campus, but, also from each other and from all the members of the community. I see children and adults at Aarohi in peace with their own self, no external negativity bothers them, they accept themselves and each other. They are free of the conditioning, so, they are not forced to choose or decide or perform based on what the society expects them to do. However, at times, I did feel that the conditioning of some of the Aarohi parents does invade the sanctity of the soulful process adopted by Aarohi. Aarohi’s experience blends in with my life journey and leaves me with a deep sense of gratitude for absorbing me and my family and I carry Aarohi in my heart wherever I go. An experience I wish for every parent every child, every family to try. In my understanding, a child who has spent time at Aarohi has had a heartwarming gift to his/ her river of life. An imprint in the river of life which will always keep the fire to learn burning in their hearts and will never let them get caught in the game to reach a final destination. 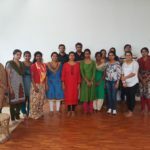 If you wish to visit Aarohi Life Education, here is a weblink to Aarohi Life Education, please be free to visit their website to know more about Aarohi. Next Next post: Traditional Foods for Improving Nutrition and Food Security!